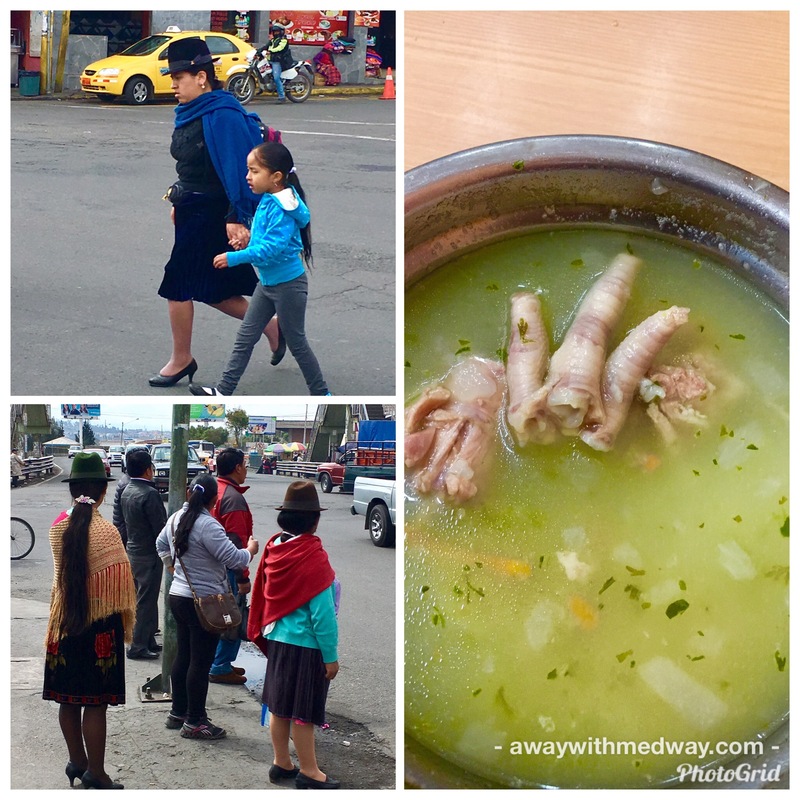 Leaving Quito and Ronja behind Laura and I head to the nearest bus stop, to get the local bus to the most southern bus terminal 11km away. That’s how big Quito is… it sprawls on forever . However as we soon realise the E2 bus we needed wasn’t as frequent as all the others, and we forget that travelling at 5pm on a weekday means rush hour in most cities. And when you are loaded with your backpacks – rush hour is not the time to be traveling on public transport. Over the years I have moaned myself at tourists using the London underground at rush hour, thinking “why do it now, why not wait”. Well having being shunted about by the locals , the bus finally arrives, but it is full to the rafters. They sure know how to pack them in. No chance of us barging in for the ride. We have no choice but to take a taxi, which again because of the rush hour traffic, took an hour to go 11km and cost $10. We both left Quito moaning how taxi drivers try and rip you off. Make sure they put the metre on when you get in, it is always cheaper. The bus to Latacunga was completely empty, it was just us and the disco lights above our heads. Only costing $6, we thought amazing no one to bother us. But alas we were out of luck. We should have known, no bus ever travels far empty. Like all busses it stoped every time someone stuck out their hand and until it was full. We opted to stay at Hotel Central due to a recommendation about the friendly staff. What I wasn’t excepting was the seventies decour and bright blue bathroom suite, the place looked like the set of ‘Faulty Towers’. The owner, the lovely old Arabic lady that emigrated to Eacuador 50 years before, however more than mad up for it. Treating us to a wholesome breakfast that included falafels before our big day and even made homemade hummus for our evening snack, at the request of Laura. 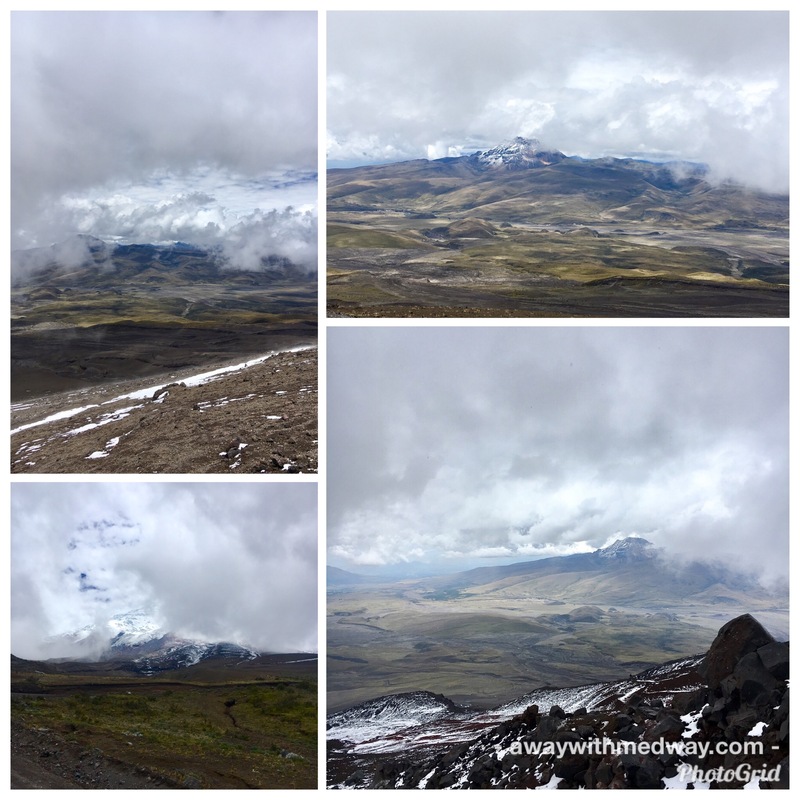 Travellling to the entrance of Cotopaxi national park was simple enough, by taking the bus for Quito from the main bus terminal in Latacunga and ask to be dropped off outside Cotopaxi Park. It was only $2 and takes 30 minutes. Once we arrived there were a couple of white 4*4 trucks waiting out side the entrance. Here we negotiated $20 each for our guide to take us in to the park and up to the 5000m point of the Volcano, via the lagoon at 3800 and the climbers refuge at 4800m. 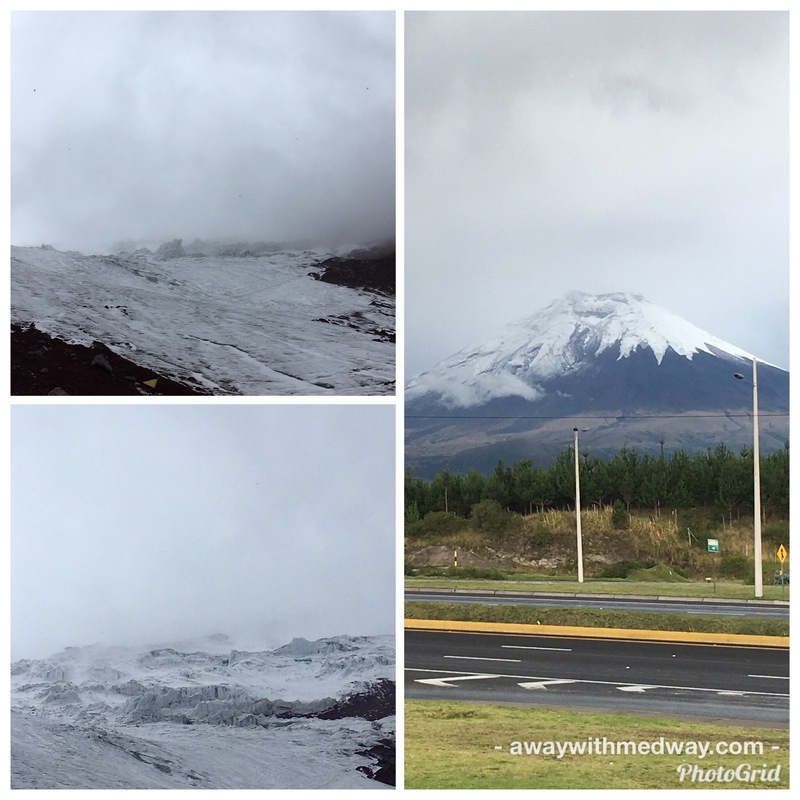 As you drive along the road the forest is dense with trees and shrub, but further into the park the pine trees start to thin out and there in front of you is the magnificent sight of the snowed topped volcano Cotopaxi. The size is impressive, as it expands for what seems like miles. The lagoon at the base was much smaller and less spectacular than I was expecting. Excited about our climb we quickly leave after ten minutes and make the drive higher to the base of the volcanoes cone. From here it will be by foot all the way to the climbers refuge. The climb was slow, and zig zagged up the side of the volcano, the earth and rock turning from black and grey, to a red colour from the last eruption. 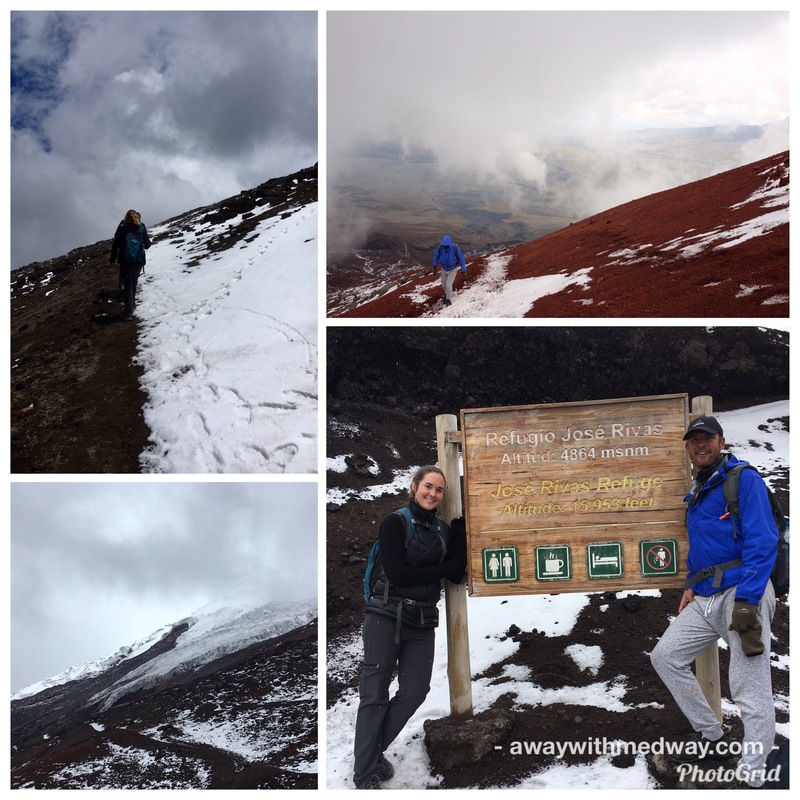 After thirty minutes the crunch of our feet on the red soil, changed to the crunch of snow ever increasing as we climbed further upwards towards 4800m. The air was getting thinner and my breathing faster. I had to stop and take a few big long breathes to control my breathing. The cloud started to clear slightly and you could see the white top of the volcano glisten in the days sun. On reaching the climbers refuge after an hour of climbing, we stopped for a food break and to recharge our bodies for the final 200 metre climb to the glacier. We met a traveller from San Francisco that was attempting the summit at 6900m the following day, and would be spending the night at the refuge. This requires some pre training at similar heights and knowing how to climb across glaciers. Although only 1.5km to the summit, it takes 6 hours to climb. This is something we were not prepared for, but walking to the edge of the glacier – we were ready. 200m again doesn’t seem that much, but when your this high it can hurt and is really slow. After another thirty minutes of climbing we made it, I checked my phone and it said 5011m. Whoop Whoop. The sense of achievement when we arrived was incredible, Laura and I hugged each other as we were so happy we had done it. Our guide sadly had had enough and wanted to head back down quick sharp. However not until we got the perfect shot… which was proving difficult due to the cloud cover being so thick. But alas the cloud started to part and the glacier started to shine brightly under the suns rays piercing through the days clouds. The decent down was much quicker and more direct, but still had its effect with my heart racing quicker and feeling a little dizzy once in the back of the 4*4. Running the last few metres turned out not to be such a good idea. We headed down in the car, back though the Park, and our guide stops the truck. I turn to see the Cotopaxi in all its glory, the cloud having parted and leaving it naked for all to see. It was back to Latacunga for some rotisserie chicken and potatoes, as this seemed to be the only cuisine in town, well other than ice cream and more hairdressers than tanning shops on an Essex high street. What I wasn’t expecting was the chicken feet in my chicken soup, but it was rather yummy once I removed them. To be honest Latacunga isn’t known for it beauty, its probably one of the ugliest cities I have ever visited, but it had a great feel about it and sense of community. Every third resident was dressed in the local dress for the area, which included a fedora hat for both the men and woman. The women wearing such wonderfully colourful combinations of greens, purples, pinks and black. Latacunga is also the best place to leave your heavy bags and do the 3 three or four day Quilotoa Loop a few hours away. 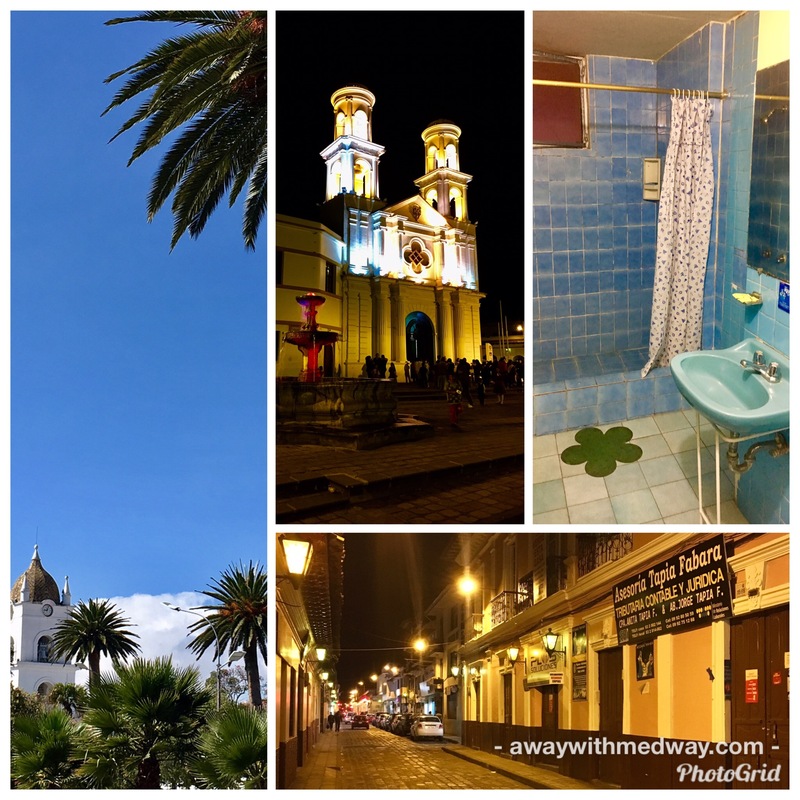 Tune is for this and more tales of Ecuador.